It happened more or less by accident; the people who made it happen were amateurs; and for the most part they still are. From his own Silicon Valley garage, author Bob Cringely puts PC big shots and nerds on the spot, and tells their incredible true stories. Like the industry itself, the series is informative, funny and brash. Silicon Valley developed the personal computer and two giants, Apple Computer and Microsoft would make them part of everyday life. 00:05:38Personal computers, the PC, were created by men like Paul Allen and Bill Gates and would go on to spawn a home computer industry in Silicon Valley. 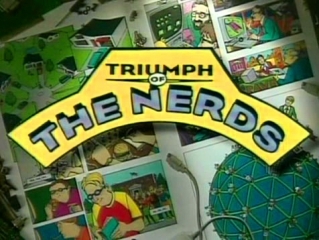 00:03:41The Altair computer led nerds to experiment and create user friendly computers. 00:08:29Paul Allen was the inventor Microcomputer BASIC and with Bill Gates founded Microsoft,, but the PC and Silicon Valley got its start because everybody shared solutions to programming challenges. 00:05:43Apple Computer was founded by Steve Wozniak and Steve Jobs, who developed the personal computer the Apple II. 00:08:30Apple II was promoted by Steve Jobs and became a big hit, later incorporating the programs such as spreadsheets, giving them the power of microcomputing. 00:04:02The PC, the personal computer industry was launched by Apple with Apple II, making a billion dollar industry in Silicon Valley. 00:07:35Bill Gates and Steve Wozniak of Apple created the foundation for the PC industry, but it was IBM that would make PC's a household tool. 00:06:17Open architecture was a means to build personal computers with what was on the shelf, but they still needed operating systems such as UNIX, CP/M, MS-DOS as provided by Paul Allen, Bill Gates and Gary Kildall. 00:04:37Bill Gates and Steve Ballmer would make Microsoft and its BASIC PC language the biggest in the world. 00:05:43IBM had computer programs such as BASIC, FORTRAN, COBO and the Paul Allen created an operating system. 00:04:51IBM legitimized the PC for America making software companies big time, while Bill Gates' DOS would become the operating system for PCs. 00:11:40Computer makers like Compaq and Dell made IBM clones, borrowing from the ROM chip, while Bill Gates and Microsoft created OS2. 00:08:10Bill Gates and Microsoft created Windows as an alternative to IBM's operating system. 00:00:53Apple launches the Macintosh computer changing the industry. 00:10:28Apple was the king of computers using graphic interface technology invented by Xerox, so Bill Gates created Windows for the PC. 00:05:28Steve Jobs, using technology pioneered by Xerox Made Apple a big player in computers. 00:03:30Steve Jobs was behind Apple's launch of the Macintosh computer. 00:03:50Microsoft thanks to DOS is growing like crazy, but Steve Ballmer and Bill Gates are interested in Steve Jobs' Macintosh. 00:08:30Apple and Steve Jobs cut a deal with Adobe to make Macintosh, or Mac, a desktop publishing dream. 00:03:24Steve Jobs of Macintosh fame left Apple. 00:07:52Microsoft and Bill Gates created Windows and later Windows 95 to compete with the Macintosh. 00:06:39Larry Ellison of Oracle has a different view of what the future holds in store for Bill Gates, Microsoft and Apple.